This lovely and historic space has been standing since 1885. Now imagine that its décor has been "updated" to gently reflect the look that was all the rage in the 1920's, art deco! Finely appointed and cozy enough to embrace you and your guests in historic charm, the Parlor will suit most medium to small meeting needs. Whether your gathering is a fine reception for up to 70, a meeting for as many as 55, dinner for up to 40, or a business or educational conference for as many as 30, those attending your event in the 1885 Parlor will enjoy its well dressed ambience. 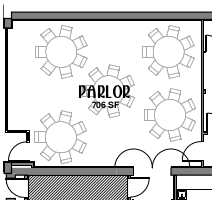 See Parlor images here. Step into our Parlor! Get a real taste of history.